PAGE, Ariz. — Celebration of Life for local resident, Elijah Blair, will be held Saturday, Feb. 16, at 1 p.m. at the Gone West Restaurant (679 S. Lake Powell Blvd.) in Page, Arizona. Service will be conducted by Dr. Pamela F. Brown with memories contributed by Paul Begay. Elijah was born Nov. 28, 1927, the son of James Lee and Maggie (Ison) Blair in McRoberts, Kentucky. He passed away Nov. 23, 2018, at the Dixie Regional Medical Center in St. George, Utah, at the age of 90. Elijah lived a full life. He was a loving husband, father, grandfather and great-grandfather. He was also proud to be known as a hillbilly, friend, adventurer, storyteller, businessman, realist, veteran, philosopher, Indian trader, and, of course, fisherman. Elijah’s rich memories began with happy childhood antics in the hills of the Appalachian Mountains in Kentucky. While attending high school at the Hindman Settlement School he met the love of his life, Claudia Nell Caler. Upon graduating, Elijah enlisted in the Army toward the end of World War II. At the time of his discharge in January 1948, his brothers, Raymond and Brad, arranged for him to travel to visit them at the trading posts they were operating in the Four Corners area. Elijah recognized the adventures possible and the opportunity of trading with the Native American people on the reservation. Thus, began his association, acceptance and appreciation of the Navajo and other Native American people. For over 60 years, he learned from, traded with and promoted the lives and artistic abilities of his customers and his friends on the reservation. On June 24, 1948, Elijah was able to travel to Brinkley, Kentucky, to marry Claudia. They returned to Toadlena Trading Post to work at their first job at a trading post. Later, he and Claudia worked, owned or were partners in Mexican Water, Aneth, Kayenta, and Dinnebito Trading Posts over their years on the reservation. As times changed the life and business of the stores on the reservations, Elijah expanded his entrepreneurial spirit and in the 1970s built the building now known as the Blair Building in Page. In 1991, he completed moving his reservation business to Page. Elijah and Claudia had three daughters, one son, six grandchildren, 14 great-grandchildren and one great-great grandchild whose lives were warmed by family time spent together and Elijah’s never-ending stories. The family established their home in Cortez in 1960 so the children could attend school. Elijah traded Navajo saddle blankets for flying lessons and bought his first plane to commute from the trading posts to Cortez to be with his family. Weekends were filled with trips to the nearby mountains and deserts, camping, fishing, picnicking and exploring. The family established their second home in Page in 1968 and more adventures on Lake Powell and the area continued. While family time was treasured, Elijah never lost sight of the opportunities, importance and even responsibility of promoting entrepreneurialism in general and the acceptance and acknowledgement of the Navajo people and culture. He was proud and honored by many opportunities to speak and serve as an advocate for such interests. Some of Elijah’s honors were as follows: Judge at the Miss Navajo pageant in Window Rock, board member of Dine Cooperative Inc. in Chinle, and board member and chairman of the 1st National Bank in Cortez. Elijah was a board member and then president of the United Indian Traders’ Association. He testified at the FTC hearings in Washington D.C., on behalf of the UITA and Native American people. 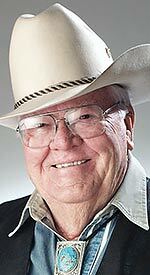 He was instrumental in UITA funding historical projects at Cline Library Special Collections and Archives at NAU. These included an oral history project, physical exhibit, website and a CD-ROM documenting the history of the association, a book about the history of Indian traders in the Southwest by Dr. Willow Roberts Powers, a business school scholarship and child development program funded at San Juan Regional College, a scholarship at the University of New Mexico-Gallup and a third business scholarship at Northern Arizona University, and a replica trading post built within the library and museum in Farmington. Elijah’s interview was filmed for the documentary “Old West Trading Posts, 100 Years of Barter and Trade” and the film “Weaving Worlds.” He was a participant in the Traders’ Rendezvous at the Cortez Cultural Center. He was a speaker at the event commemorating the 100th anniversary of the establishment of Rainbow Bridge National Monument. He provided memorabilia and merchandise for a two-year exhibit honoring Navajo weaving at the John Wesley Powell Museum in Page. In 2014, Elijah’s book “From Hoot Owl Holler to Indian Country” was published. Most recently, he helped establish the Trading Post exhibit at the Powell Museum showcasing memorabilia, merchandise and art from his years of trading. Elijah and Claudia were avid travelers, spurred by their adventurous spirits and natural curiosity and interest in people and cultures. They visited every state, most often pulling their camper and exploring every little side road, small town, lake, river, or stream where they could cast a line. Other travels they enjoyed were to Switzerland, Canada, Mexico, Australia, New Zealand, the British Isles, a Panama Canal cruise, Jamaica, and Fiji. Elijah is survived by his daughters, Kathy Ann Blair (Bob Ingeholm) of Page, and Vonda Lynn Garland (Bill) of Arriola, Colorado; son, James Caler Blair (Sandy) of Page; and six grandchildren, 14 great grandchildren and one great-great grandchild. Elijah is preceded in death by his wife Claudia; infant daughter, Sandra K. Blair; parents, James Lee and Maggie (Ison) Blair; and siblings, Denver Blair, Hazel Tolliver, Raymond Blair, Pauline Forrester, Bradley Blair, Marian Morrison and Serena Blair. Memorial contributions may be made in Elijah’s name to Dolores State Bank, P.O. Box 848, Dolores, CO 81323 for the United Indian Traders Entrepreneur Scholarship at N.A.U. School of Business. GALLUP — Funeral services for Diane Rose Deschene, 36, were held Feb. 2 at the LDS Church in Gallup. Interment followed at the family plot in Navajo, New Mexico. Diane was born April 5, 1982, in Gallup, into the Dibélzhíní (Black Sheep Clan), born for Kiyaa’áanii (Towering House Clan). Her nali is Táchii’nii (Red Running Into the Water); chei is Mescalero Apache. She passed away Jan. 26, 2019, in Farmington. Diane attended college at Apollo/Carrington College in Albuquerque, and worked at the University of New Mexico Hospital and Isleta Indian Health Service as a medical clerk. Diane enjoyed beadwork in her spare time, reading books and spending time with her daughter, nieces and nephews. Diane is survived by her daughter, Kierra Bitahey; father, Daniel Deschene Sr.; brothers, Daniel Deschene Jr., Nathaniel Deschene and Vance Deschene; and sisters, Lavina Deschene and Melissa Deschene. Diane is preceded in death by her mother, Veronica Deschene; aunt, Virginia Anderson; and grandmothers, Annette Shorty and Anna Anderson. COUNSELOR, N.M. — Funeral services for Bessie Sala Pinto, 83, of Counselor, New Mexico, were held Feb. 2 at the Cedar Hill Church in Counselor, with Pastor Peter Sala officiating. Interment followed at the Counselor community cemetery. Bessie was born April 22, 1935, in Towaoc, Colorado, into the Táchii’nii (Red Running Into the Water People Clan), born for Ashiihí (Salt People Clan). She passed away Jan. 25, 2019, in Rio Rancho, New Mexico. Bessie was a homemaker who enjoyed weaving and raised many children. She loved cooking and owned her own restaurant where people ate for free. Bessie is survived by her daughters, Joan Manygoats and Jean Pinto; brother, Jimmie Salazar; sister, Pat Harrison; and 16 grandchildren, 41 great-grandchildren and three great-great-grandchildren. Bessie is preceded in death by her husband, Jake Pinto; and sons, David Pinto, Mike Pinto and Teddy Pinto. Pallbearers were Larry Manygoats, Freddie Pinto, Kevin Chiquito Sr., Isaiah Largo, Joshua Largo, Roland Castillo, Micheal Castillo and Franklin Pinto Jr.
Honorary pallbearers were Franklin Pinto Sr., Kevin Chiquito Jr., Vincent Smith, Frederick Pinto, Victor Smith, Noah Largo, Cecil Jim Jr., Faron Pinto, Robert Dowdy and Nathaniel Manygoats. Daniels Family Funeral Services—Alameda Mortuary was in charge of arrangements.